It’s time to focus on the fun activities that come with fall. For many families that means a trip to the local apple orchard, where you can sample some of the rich harvest gathered by our region’s plentiful farmland. In addition to picking apples and corralling pumpkins, many of our region’s orchards have additional activities such as petting zoos, gift shops and fire pits as well as tasty treats including apple pie, apple cider and those ever-popular apple doughnuts. With the arrival of cooler weather, you can find an exciting taste of autumn at these true Midwestern destinations. Jonamac Orchard wasn’t open even five minutes on a cool, late-summer morning when carloads of families began pulling into the parking lot. Available inside the bake shop, those classic doughnuts are available with fresh apple cider, caramel apples and many other sweet treats. Jonamac Apple Orchard sits on 105 acres of land that harbor some 16,000 apple trees. Many visitors flock to the 20-acre pick-your-own orchard, which has 40 varieties of apples available through the season. While you’re exploring the orchard, be sure to reserve one of the private campfire sites. Available on weekends only, these sites come with firewood, benches and a countertop to prepare food. Jonamac also has a 12-acre haunted corn maze, which is open Friday and Saturday nights in October. The corn maze and apple picking are available through the end of October. The bakery is open until Nov. 23 – the day before Thanksgiving. “Families look forward to purchasing their Thanksgiving pies from us,” Spychal says. Apple cannons are just the beginning at this orchard and farm, which offers you-pick apples and pumpkins as well as a 12-acre corn maze. 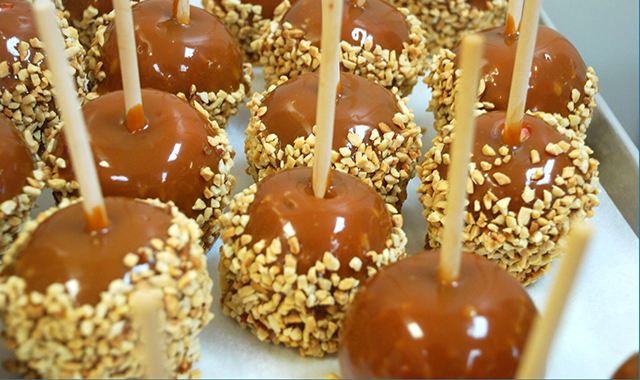 From homemade caramel to fresh-pressed cider, everything is made on site. To satisfy increasing demand, All Seasons recently unveiled a new cider mill and bakery where visitors can see how these products are made. The nearby farm market carries all of the seasonal favorites, including apple cider doughnuts, pre-picked apples, fresh cider, preserves and honey. “Our apple cider doughnuts are probably the second-most important thing on this farm – other than the apples,” Hong says. The orchard is open daily from Sept. 3 to Oct. 30. Royal Oak Farm has what may be the country’s only apple tree maze. The 4.5-acre maze, shaped like an apple hanging on a tree, holds more than 3,000 apple trees in nine varieties. The maze includes more than 1.5 miles of walking trails, three activity areas, a climbing tower and a variety of children’s games. The climbing tower also serves as an observation tower, where guests can see the entire orchard if they get lost. People are able to see the path they need to take. “It takes about 45 minutes to an hour to complete,” says Sarah Bell, co-owner of the family-operated orchard. In addition to the orchard’s 160 acres of apple trees in 30 varieties, Royal Oak has 20 acres of park and entertainment, including a petting zoo, market/bakery and a cider mill, which has a viewing window where you can watch the cider-making process. The orchard is open from mid-August through mid-November. Anthony DeMoon, owner of Heinz Orchard, likes to keep things simple. The orchard has no corn mazes, no hayrides, no pumpkins and no places to purchase apple cider and apple doughnuts. Focusing only on apples has provided Heinz Orchard quite the expertise in this delicious fruit. The farm produces five types of apples, which range in flavor and texture: McIntosh, Jonathan, Empire, Red Delicious and Golden Delicious. Raw, natural honey is for sale on a first-come, first-served basis. The orchard, which has been producing fruit for nearly six decades, typically opens in mid-September and stays open for about six weeks. It’s open to the public every weekend, Friday though Sunday. Visit the orchard’s website to see when your favorite apple will be available, and to double-check operating hours, which can vary. “I want people to come out and enjoy the fall temperatures before the harsh Chicago winter comes,” DeMoon says. The annual Fall Extravaganza is big deal at this family-owned farm, which is open year-round. During the annual Fall Extravaganza, which runs through October, these fields near Hampshire yield a bounty of fresh pumpkins, gourds, summer squash and corn stalk bundles, among other things. Pumpkins are aplenty and available pre-picked or you-pick. Other fall staples like mums, Indian corn, popcorn and straw bales are available, in addition to freshly picked winter squash that are ready to eat. 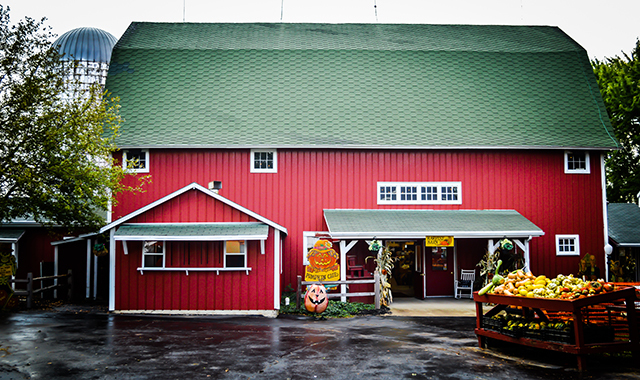 Fall is a bounteous time at Enjoy Pioneer Farm, but that’s just one season. Come Christmastime, the farm sells wreaths, roping and boughs. “In the spring, we feature “Hold a Baby Lamb,’ where people can hold the lambs, goats, pig, chicks, ducklings and feed the calf a baby bottle,” Burnidge says. June begins the U-Pick Farm Garden, a special subscription package that enables the public to harvest whatever’s growing fresh on the farm. The 2016 season runs for some 20 weeks and includes crops like micro greens, beans, broccoli, cabbage, peppers and spinach – among many others. 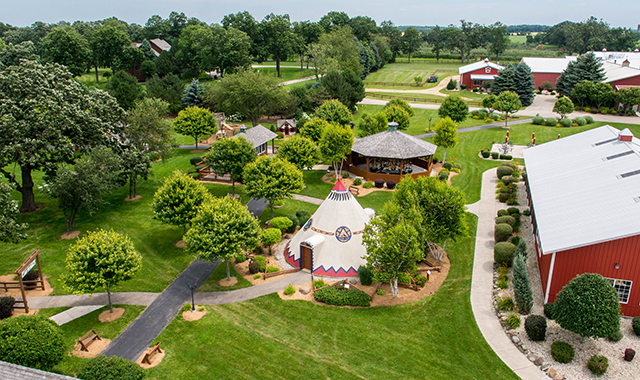 The farm is open daily from sunrise to sunset. It’s pretty hard not to find Goebbert’s Pumpkin Patch. The large pumpkin sitting atop its silo is a definite giveaway. Whether families visit this Hampshire-area farm or its sister farm in Hoffman Estates, they’re sure to find a classic assortment of fall fun. Because this is a family operation, co-owner Terry Goebbert wants to treat every guest like family. In addition to the pumpkin farm, where families can pick a freshly grown orange orb, kids can enjoy riding ponies and camels, or visiting the petting farm. The youngsters also get a kick out of the pumpkin-eating dinosaur: a handmade, mechanical dinosaur that squashes any pumpkin in its jaws. There’s plenty of food served as well, including apple doughnuts, apple cider and homemade caramel apples. Starting next season, visitors will also find a you-pick apple orchard. The pumpkin patch and farm are open from mid-September through Halloween. 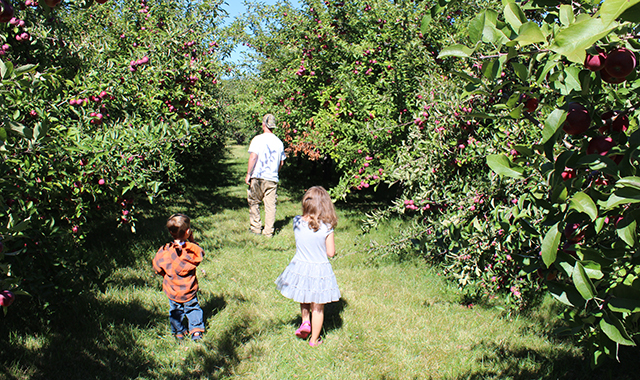 Hafs Road Orchard is bursting with fresh apples for pies, applesauce, apple crisp and any other apple-related dishes. Apples are the stars at this small, no-frills orchard. There’s no pick-your-own, no hayrides and no petting zoos. But apples and produce are aplenty, in the form of fresh fruit, fresh cider, Honeycrisp caramel apples, pumpkins, gourds and many varieties of winter squash. Although the orchard grows 45 kinds of apples, the Honeycrisp variety is a specialty. Polansky invites apple lovers to enjoy the quiet, rural and leisurely orchard, which comes alive during the fall season. The orchard is open daily from Labor Day through Thanksgiving. In the past, the orchard has remained opened later, until the apples are sold. What started out as a 71-acre pumpkin farm in 1998 has blossomed into a 230-acre family farm. Kuipers Family Farm has a pumpkin patch, apple orchard and a Christmas tree farm, which makes this a great multi-season attraction. 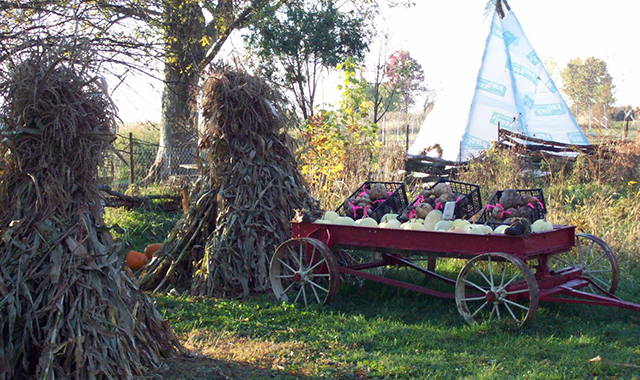 The pumpkin patch has a variety of fall activities, including hay wagon rides, a petting zoo and haunted forest. 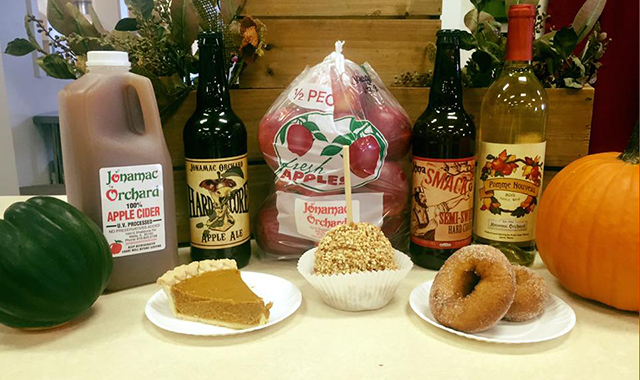 The farm store carries plenty of fall favorites, including apple cider doughnuts, pies and apple cider. “We have seasonal gifts, specialty foods and we have farm-related home decor,” says Kim Kuipers, who owns the farm with other members of her family. The 160-acre apple orchard has more than 20 apple varieties suitable for snacking or cooking. The orchard also serves as a wedding venue, with spectacular views of the orchard. Weddings are available from November through mid-August. Because of the autumn harvest, weddings are not available late-August through October. Saturdays are already booked for next year, but Kuipers says plenty of dates are still available on Fridays and Sundays. 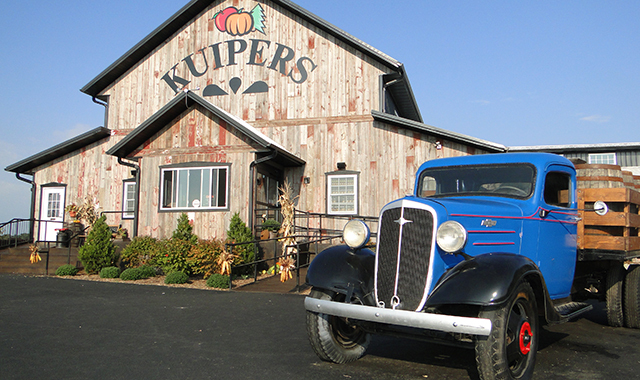 Kuipers Family Farm is open daily until Dec. 18.
Who can resist picking pumpkins in fall? 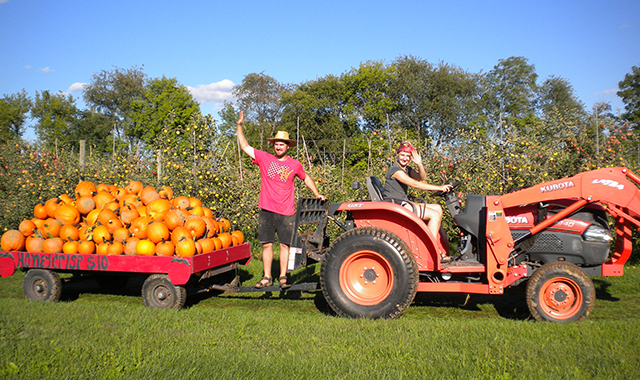 The new owners of this Caledonia tradition want to share their love for pumpkins. “There used to be a charge, but now it’s free to get in,” says Cheryl Lindberg, one of the co-owners of The Pumpkin Patch. To make it even easier to grab your favorite pumpkin, the Pumpkin Patch gives old-fashioned wagon rides to the you-pick fields, which contain some 30 varieties of pumpkins. 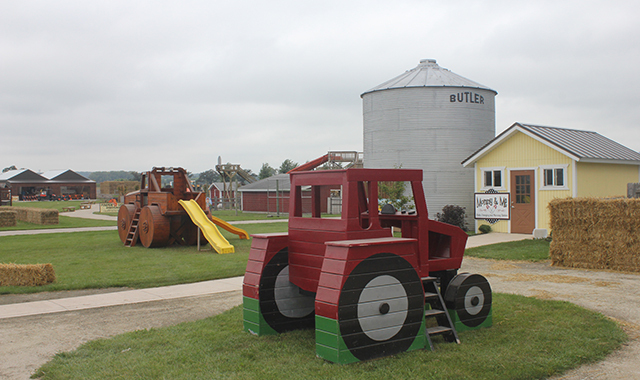 Set on an old farmstead, the Pumpkin Patch has plenty of activities for kids and adults to enjoy. There’s Wanda’s Web, a seven-acre corn maze that follows a different route each year. The petting zoo introduces you to chickens, goats and other barnyard animals that the whole family can feed. Get something to eat for yourselves at several food stands. The farm is a great place to enjoy all that fall has to offer, says Lindberg. The Pumpkin Patch is open daily through Halloween. This entry was posted on Monday, October 10th, 2016 at 12:00 pm	and is filed under Features, Top Posts. You can follow any responses to this entry through the RSS 2.0 feed. Both comments and pings are currently closed.